ticketcombat wrote: Naomi, your ticket is invalid. The ticket you have is called a "notice of offence" and it is covered by Regulation 950 of the Provincial Offences Act. Hopefully this won't be too confusing. There are two different forms. Form 5 is for jurisdictions where you can request a trial by mail. Form 5.1 is for jurisdictions where you must attend in person to request a trial. You have form 5.1 because in Peel you must go to the court house to request a trial. On January 1, 2009 the ticket (Form 5 and 5.1) changed. They have to stop using the old ticket and start issuing the new version of the ticket. 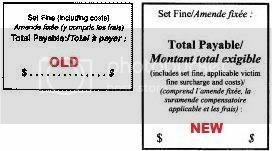 To get a better understanding of this, the July 28, 2008 version of the Regulation shows both the old and new tickets. Just scroll down to see both versions. It gave all the cities 6 months notice to get their act together by Jan 1, 2009. Peel didn't. You have been given the old version instead of the new version. The difference between the old and new version is the "total payable" box in the bottom centre of the page. It's different and allows for more information about the set fine. The second change is in the wording of the options on page 2. For example, Option 2 used to read "plead guilty with an explanation", now it reads "plea of guilty - submissions as to penalty". These are not trivial changes. They are significant as to communicate to the defendant the nature of the charge and the options you have available. Peel Region has been using the wrong ticket since the beginning of the year. Basically every red light camera ticket they issue is invalid. I am currently in court trying to get a ruling but it's been deferred to August. But that shouldn't stop you from making the same argument. TC, Naomi - I read your posts with great interest. I have just (Oct 14, 2009) received a red-light camera ticket in the mail. It would appear to be the wrong form as well (older form 5 - not 5.1). The offence took place September 22. Terribly unclear as to the intersection when viewing the picture, in fact, impossible to make out at all. TC - how might I contact you so that you could guide me through the process of beating this fine? I look forward to chatting. Hopefully, I can learn from this forum, exactly what steps are required to succeed. The deemed service date is actually tomorrow - 16-Oct-2009, so I have another 15 days to respond. Hope to hear back soon. BigDen wrote: Great job TicketCombat! I too am in Ottawa. As your court date has passed ...... please enlighten us all. How did it go for you? Did you succeed? If so, how did you manage to do so? ÃƒÂ¢Ã‚â‚¬Ã‚â€œnoun, plural -ties for 2, 3. 1. the quality or state of being irregular. 3. a breach of rules, customs, etiquette, morality, etc. 1. Quashing a proceeding, except under section 9, 18.3 or 18.5 of the Act or under section 205.7 or 205.19 of the Highway Traffic Act. 2. Amending an information, a certificate of offence or a certificate of parking infraction. O. Reg. 498/94, s. 10; O. Reg. 567/00, s. 2. (c) is in any way defective in substance or in form. 1. a shortcoming, fault, or imperfection: a defect in an argument; a defect in a machine. 2. lack or want, esp. of something essential to perfection or completeness; deficiency: a defect in hearing. Is a "revoked" form defective or irregular? Tough call. From the case literature I have seen, most rule that substance matters, not form. All of the cases I have been able to find have dealt with mistakes and errors in the form (mostly summons and certificates of offence) made by the police officer but none that I could find dealt with a revoked form. How the JP rules is pretty much a *EDIT*-shoot (I know there is case history out there but I couldn't locate it but it all seems to have been dealt with at the lowest level). ...but its repeal left a void. Hence, since constitutionally, municipalities are not recognized but empowered by the province only, anything that is not clearly stated (either im- or explicitly) automatically defaults to the province. Therefore, in this matter, the municipality had to use the correct form since they didn't have the authority to do otherwise. Greatest Canadian wrote: The certificate of offence and offence notice are one document but two forms. When it is filled out the top part is the certificate and the carbon copy is the offence notice. The certificate is Form 2 and the offence notice is either Form 5 or 5.1, depending on if the offence was committed in a prescribed or non precribed part of Ontario. At least this is how non red light certificate of offences and offence notices work. Interesting. I guess my question would be what validates what. Does the certificate of offence validate the offence notice or vice versa? My thoughts are that the certificate is essential. But does section 90 (1) even apply if the certificate is valid? Is it perhaps built on the assumption that the certificate is always correct (disputable only in a proceeding) and that any errors on the forms the defendant receives are saveable through 90 (1)? Why would section 90 (1) have to apply to a certificate if it is correct and the offence notice is not??? The use of the word "may" signifies that it is at their discretion. Furthermore, it seems that, invalid or not, if you get something, it is more then sufficient. Okay, so I understand that a certificate must not be defective as according to section 90 (1) (a). But an offence form is not a certificate as we've covered. So, how do we know if the certificate is defective? Is it because the offence notice itself is invalid or does it have to do with the set fine being incorrect as per your Fri Oct 16, 2009 9:43 am post? Say that the certificate is correct. How then can the proceedings be invalidated? This discussion was very helpful and provided some needed clarity. Appreciate you taking the time to answer my inquiries. I'm approaching the factum with a slightly different argument than what you've outlined but similar in substance (lame pun intended). I'll fill in the details when I have a bit more time; at work right now. This thread is interesting because I just got one of these red light camera offence notices and it is the old 5.1 form. The offence was Oct 17. So what is the concensus on the recommended action to take? Should I just go into Mississauga court and say that this form was invalid because it's the old form and therefore this case should be dismissed? BigDen wrote: In answer to "Blanket's" question of a few weeks ago: "I too am in Ottawa. As your court date has passed ...... please enlighten us all. How did it go for you? Did you succeed? If so, how did you manage to do so? "; The charge was dismissed. The Justice of the Peace asked me how I plead and I said "not guilty Your Worship." She asked the prosecutor for the evidence (ie. the photo) but they did not have it. As there was no evidence against me the JP said I was free to leave the court room with no conviction. Therefore, I never had to argue about the invalid ticket. That's great. But weren't we suppose to bring up the issue about the invalid ticket before we plea guilty or not guilty? I was not given a chance...the JP simply asked me how I plead. BigDen wrote: I was not given a chance...the JP simply asked me how I plead. Did you know they didn't have a copy of the offence notice (which has the photos)? If they did, you probably would have had to pay full fine. What was your strategy going into your court date? The car I normally drive is in my wife's name and she received a Form 5 Notice of Offense... also on the old form. It is not clear from the photographic evidence that I did not stop (my brake lights are on and turn indicator). I was turning right on a red light where this is allowed. My question is can I represent her in court to fight this? If so, what is the procedure? I have got similar ticket on Oct. 15. then I found this topic and read through all. I am making a left turn. at a speed of 31 kmh. - picture shows I was roughly 1 feet approaching to the pedestrian line when the red light already on for 0.3 second. - pic 2, shows at 2.1 seconds. while I almost completed my left turning. same speed: 31kmh. 1. I have the 5.1 form, like your guys, but old format. I am not sure whether this makes sense as a bargain chip. 2. the 0.3 second, officers "signature" and the officers code " 8 " are the same as other people in this post. - my ticket is taken in Cambridge, Ontario. - one post in this topic mentioned 3.6 s of amber for min. I traced to the reference website, it is a USA website. - I did searched some website, but it is business, asking for the info is going to cost me $366. Question: Isn't the amber light duration/timing information supposed to be accessible to the public? 4. the ticket says 0.3 second and 2.1 second. so detailed to 0.x second. But why the picture only show minutes? both picture says 18:40. no second. As everyone knows, every camera or camcorder, it does display time and date as detail as to second. Anyway, I will do go to the court and plead, will set time this afternoon, and the date would be this Friday (Nov. 5) if possible. I will keep updating my sequence in this topic.